The Home Learners Program at Hume Park is a community-based, fully funded Kindergarten to Grade 8 program for families who choose to take an active role in the education of their children. Our program focuses on a three-way partnership between teachers, parents, and children, while respecting individual learning styles and family goals. The key to the success of students in our program is the active daily involvement of parents in their child’s learning. Each of our BC certified teachers works with an entire family usually over a number of years. 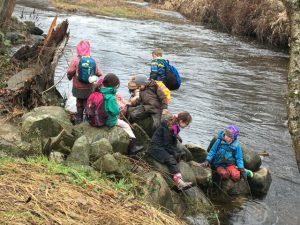 Our Learning Centre is located in the beautiful Hume Park, New Westminster, providing a warm and friendly learning environment, as well as access to the park, urban forest and the Brunette River. Students attend our Learning Centre in Hume Park part-time, to meet others and learn in group settings. Class topics are chosen to reflect the interests and needs of students and families. Teachers encourage the child’s natural curiosity and love of learning. We run a variety of programs and classes including Outdoor Explorers, Applied Skills, Music, Art, Drama, Read-Write-Think classes, Exploring Words and Numbers, PE, Showcase days, and our Family Camp in May each year. Please follow this link to the LearnNowBC Website.